Many leading intellectual figures on the international legal stage are judges or government officials whose duties prevent them from spending more than a week or so away from home. To gain the benefit of such people in our community, some of whom are former academics, the Hauser Global Law School Program invites them to campus as Distinguished Global Fellows. During their brief visits, the distinguished fellows may participate in selected classes, seminars, colloquia, or other occasional lecture series such as the Distinguished Global Fellows Lecture Series. Susanne Baer serves as Justice of the Federal Constitutional Court in Germany, elected by parliament, the Deutscher Bundestag, in 2011 to the First Senate, for a 12 years term. She is also the Professor of Public Law and Gender Studies at Humboldt University Berlin and a James W. Cook Global Law Professor at the University of Michigan Law School, and has taught at CEU Budapest, in Austria, Switzerland and Canada. She received an honorary doctorate from the University of Michigan in 2014 and from the University of Hasselt in 2018 and was elected a Coresponding Fellow of the British Academy in 2017. 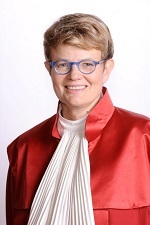 Justice Baer studied law and political science and joined movements against discrimination and domestic violence; she directed the GenderCompetenceCentre to advise the German federal government on gender mainstreaming 2003-2010 and co-drafted German standards for equality in research. At Humboldt University, she served as Vice-President and as Vice Dean and Director of Gender Studies, founded the Law and Society Institute Berlin and the Humboldt Law Clinic in Fundamental and Human Rights. Publications in English include: Comparative Constitutionalism. 3rd edition, Thomson/West 2016 (with Norman Dorsen, Michel Rosenfeld, András Sajó, Susanna Mancini); Privatizing Religion, Constellations 1 (2013), 68 - 84; Equality, in: Rosenfeld/ Sajo, The Oxford Handbook of Comparative Constitutional Law, OUP 2012, 982-1001; Dignity, Liberty, Equality: A Fundamental Rights Triangle of Constitutionalism, To-ronto LJ 4 (2009) 417-468; The Difference a Justice May Make: Remarks at the Symposium for Justice Ruth Bader Ginsburg, Columbia J of Gender & Law 25 (2013). Lectures online in English: Adjudicating Inequalities (Duke University Bernstein Lecture 2013-2014); Rights Under Pressure: practising constitutional law in turbulent times (LSE London 2016); "Inequalities", with Catharine MacKinnon (ICON-S Conference 2016, Plenary Session 2); "The Future of the University Community", with Justice Sonia Sotomayor (University of Michigan, USA 2017).